U.S. Air Force Gen. Darren W. McDew, Commander, U.S. Transportation Command (USTRANSCOM), visited the U.S. Merchant Marine Academy (USMMA) at Kings Point. Gen. McDew speaks with Midshipman 1st Class Blair Roberts and Midshipman 1st Class Michael Babowice during his tour with Lt. Fionna Boyle, U.S. Navy, and Superintendent, Rear Adm. James A. Helis, USMS. 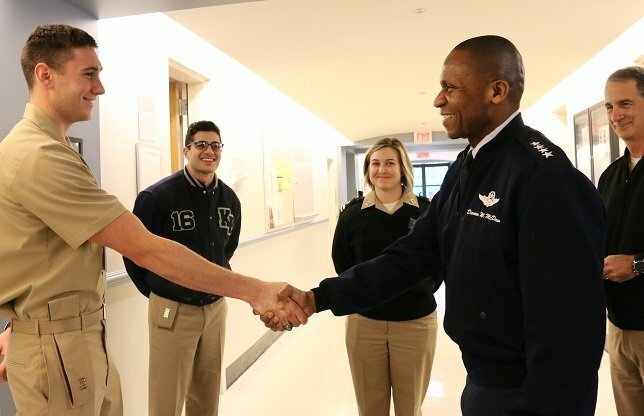 Kings Point, NY - February 2, 2016 - U.S. Air Force Gen. Darren W. McDew, Commander, U.S. Transportation Command (USTRANSCOM), visited the U.S. Merchant Marine Academy (USMMA) at Kings Point yesterday. Located at Scott Air Force Base, Ill., USTRANSCOM is the Department of Defense’s single manager for global air, land and sea transportation. The General took questions from a dozen midshipmen and faculty on a range of issues including leadership development, industry trends, joint-service challenges, and recruitment and retention of merchant mariners. Subject: LongIsland.com - Your Name sent you Article details of "U.S. Air Force Gen. Darren W. McDew, Commander, U.S. Transportation Command, Visits U.S. Merchant Marine Academy"